We offer a free, confidential and respectful sexual health services to everyone regardless of their age. You will see posters in every service assuring you of the confidential nature of the service. Systems have been put in place to protect your identity in the waiting areas and your name won’t be called out. Consultation rooms are private and conversations cannot be overheard by other people. 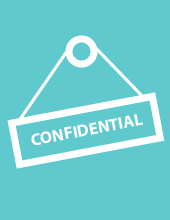 You will be encouraged to give the professional you are seeing information about yourself such as your name, date of birth, address and information about your sexual history but this information will not be shared with anyone outside of the service without your permission unless they are concerned about the safety of you or somebody else. No, your visit to WiSH sexual health is confidential. We won’t tell your GP without your permission. I’m under 16, will you tell my parents I’ve been? No. Even if you’re under 16, your visit will be treated as confidential but you will be encouraged to talk to a parent or carer about your visit if you can. If a professional feels that you may be at serious risk of sexual exploitation then they have a duty of care to share this information with other professionals to keep you safe. In most situations they will share with you their concerns, and with whom they want to share your details with. Will you send test results to my home address? I’m concerned someone else might see this. You will be given a choice of how you would like the service to communicate with you. Many people provide a mobile phone number so that the service can phone or text them. You can also choose for results and communications to be sent to your home address but you would have to give your specific permission for this.